TO REDEEM OFFER: Add qualifying in-stock items totaling $50 USD or more to your shopping bag. Enter offer code SHIP50 at checkout. Standard shipping & handling charges will automatically be deducted for eligible orders after offer code is applied. Valid December 31, 2018 through January 3, 2019 at 11:59pm PT. OFFER EXCLUDES THE FOLLOWING: Shipping & handling, taxes, gift cards, gift wrap & kits do not qualify towards the minimum purchase. 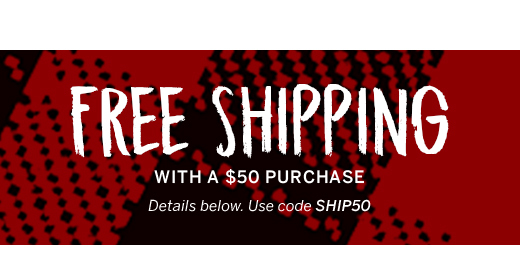 Not valid with any other shipping offers, previous purchases or store purchases. ADDITIONAL OFFER DETAILS: Valid for standard shipping & handling anywhere in the United States & Canada. Offer subject to adjustment due to returns, cancellations and exchanges. Offer may be modified or discontinued at any time without notice.